The National Beneficiary Survey (NBS) is a study sponsored by the Social Security Administration. The NBS asks about your health, work, and employment-related services you may have received in the past year. The goal is to use the information from the survey to make programs better for people who get Social Security Disability Insurance (SSDI) or Supplemental Security Income (SSI). We selected you randomly from a list of all individuals who receive disability benefits from us. We are asking you to share your experiences to help us make our programs better. Your participation will benefit not only yourself, but also others who receive these benefits or administer these programs. Your response makes a difference and your help is critical to the survey’s success. We greatly appreciate your assistance. We hired a company, Mathematica Policy Research, to help us with this study. Mathematica conducts NBS interviews only over the telephone or in-person. Also, if you were chosen to participate, you may have received letters, postcards, or brochures from the Social Security Administration or Mathematica staff may have called you or visited your home. When contacted, if you are concerned about the legitimacy of the study or the interviewer, please hang up and call Mathematica Policy Research’s toll-free number at 1-877-293-5740 to speak with a supervisor who will verify the interviewer. If you choose, you can also complete the interview over the phone. Take the survey. Mathematica will send you a $30 gift card as a thank you for completing the survey. Schedule a time to take the survey later and someone will call you back when you are ready. Let us know that you are not interested in participating so we can update our records. If you are called by Mathematica and are concerned about the legitimacy of the study or the interviewer, please hang up and call Mathematica Policy Research’s toll-free number at 1-877-293-5740 to speak with a supervisor, verify the interviewer, and/or complete the interview over the phone. 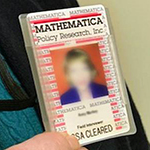 We require all in-person interviewers to show a Mathematica Policy Research badge (see below) that displays a color photograph of the interviewer, the name of the survey, and the toll-free National Beneficiary Survey help desk number 1-877-293-5740. What is the National Beneficiary Survey? The National Beneficiary Survey (NBS) is a survey conducted by the Social Security Administration. Through the NBS, we gather information about people who receive Social Security Disability Insurance (SSDI) or Supplemental Security Income (SSI). It tells us about their health and well-being, the health and employment services they use, their experiences with Social Security programs, their employment goals, their education and other information that is not available elsewhere. The study will help us learn how well our programs meet your needs and the needs of people like you. The information you provide will give us a better understanding of the characteristics of SSDI beneficiaries and SSI recipients. We are conducting the NBS for policy and research purposes and we use the information to assess how well our programs work and to respond to questions from Congress and the Office of Management and Budget (OMB). For information about the NBS or to access documentation, please visit our NBS page. Who is responsible for conducting the survey? We hired Mathematica Policy Research to conduct the interviews and process the data. Mathematica is an independent, non-partisan research firm. Why does the government collect statistics on the individuals who receive disability benefits? Supplemental Security Income (SSI) and Social Security Disability Insurance (SSDI) are among the largest programs that the Federal government runs. It is important for policymakers to have a complete picture of the individuals who receive disability benefits so we can base our policies on accurate information. We combine your answers with answers of others who participate to produce important statistical information about SSI recipients and SSDI beneficiaries. We use the combined answers to the questions in the NBS to provide a portrait of SSI recipients and SSDI beneficiaries with information that we do not have in our files. The statistics tell Congress and us about your health and well-being, the health and employment services you use, your experience with Social Security programs, your employment goals, and your education. How many completed high school? How many have young children? How many have limitations in daily activities, such as climbing stairs? How many are interested in working? their employer, if they work? What should I expect if I participate? About a week after you receive our letter asking you to participate, someone from Mathematica Policy Research will call to speak with you. If you would like to take the survey now, please call Mathematica Policy Research at 1-877-293-5740 (toll-free) or send an email tonbshelp@mathematica-mpr.com. If you need help or special assistance to take the survey, Mathematica Policy Research will interview you in person or you can use Telecommunications Relay Service (TRS), Video Relay Service (VRS), amplifiers, and instant messaging. Mathematica staff will ask you some questions to verify that you are eligible for the survey. If you are eligible for the survey and complete an interview, Mathematica will send you a $30 gift card as our thanks! The average interview for the National Beneficiary Survey takes about 60 minutes. Am I required to participate in the survey? No. Your participation is voluntary and you may refuse to answer any questions you do not want to answer. If you decide not to participate, it will not affect your benefits in any way. Although taking part is your choice, your input will help make our programs better. Your participation will benefit not only yourself, but also others. Your answers represent those receiving disability benefits all across the country, so your taking part is very important to the success of the survey. We will combine your answers with those of other participants and use the data for policy and research only. We will not share your answers in a way that reveals who you are. We will not use your information to make decisions about your disability benefits. If you do not want to participate, please call Mathematica Policy Research at 1-877-293-5740 (toll-free). How will I complete the survey? An employee from Mathematica Policy Research will interview you over the telephone or at your home. If you would like to take the survey now, set up a time for the interview or need help to take part in the survey, please call Mathematica at 1-877-293-5740 (toll-free) or send an email to nbshelp@mathematica-mpr.com. What kinds of questions will you ask me? We will ask you questions about your health and well-being, the health and employment services you use, your experience with Social Security programs, your employment goals, and your education. All information that we collect is strictly confidential and we do not report it in any way that identifies survey participants. We will not use your information to make decisions about your disability benefits. How many receive accommodations from their employer, if they work? If I think a question is too personal, do I have to answer it? No. You do not need to answer a question that you feel is too personal. Answering all of the questions does help us obtain a more complete picture of individuals who receive our benefits. All information that we collect is strictly confidential and we do not use it in any way that identifies survey participants. How did you select me to be in the survey? We selected you from a list of all individuals who receive disability benefits from the Social Security Administration. We selected you randomly from the list, similar to a lottery. Your participation in the survey is very important to the survey’s success and we greatly appreciate your assistance. I already completed the survey in 2017. Why are you contacting me again? You may have completed the survey around two years ago, but we would like to speak to you again about what might have changed since then. The questions will be similar to the questions we asked you in 2017, and you will receive another $30 gift card for completing the survey. I’m not available right now. Can someone else answer instead? Because you were scientifically selected to participate, you cannot be replaced! We can schedule a time for the interview that is convenient for you. You can also do the survey in parts if that is more convenient. Your answers represent people all across the country who receive our benefits. If you want to set up a time to talk now or need help to take part in the survey, please call Mathematica Policy Research at 1-877-293-5740 (toll-free) or send an email to nbshelp@mathematica-mpr.com. I’m unable to respond to the survey due to a disability. Can someone else respond for me? It is important that you respond to the survey. If you need special assistance Mathematica Policy Research can interview you in person or you can use Telecommunications Relay Service (TRS), Video Relay Service (VRS), amplifiers, and instant messaging. If your disability prevents you from being able to respond, we can conduct the interview with a close family member or other representative on your behalf. Please have a representative call Mathematica Policy Research at 1-877-293-5740 (toll-free) or send an email to nbshelp@mathematica-mpr.com. Can I contact someone to discuss my concerns before completing the survey? Yes. If you would like to discuss any concerns or ask additional questions about the survey, please call Mathematica Policy Research at 1-877-293-5740 or send an email tonbshelp@mathematica-mpr.com. You can also contact our NBS mailbox at NBS@ssa.gov. Will you keep my responses and personal information private, and how will you protect my data? Yes. We take protecting your privacy and confidentiality very seriously. We use the information we collect about you in this survey for statistical and research purposes only. In all study reports that use your responses, we will publish only summaries of the answers. We will never use your name or any other information that can identify you in a study report. Federal law requires us to protect your data. We store all study information in secure facilities on locked systems and will destroy your response data when it is no longer needed for research or statistical purposes. All employees of Mathematica Policy Research who conduct the interviews or summarize the responses to the questions must pass a security clearance before they begin work on the survey. They sign an agreement to safeguard your information and follow the government’s relevant privacy laws and policies. All researchers who use your survey data must also pass a security clearance and sign an agreement that they will safeguard your information and follow the government’s relevant privacy laws and policies before they use the survey data. Any of our staff, any researcher, or any Mathematica employee who violates these Federal laws and policies faces disciplinary action or criminal prosecution. How do I know if the interviewer is legitimate and/or from Mathematica Policy Research? Our contractor, Mathematica Policy Research, conducts NBS interviews only over the phone or in-person. If you are concerned about the legitimacy of the study or the interviewer, please hang up and call Mathematica Policy Research’s toll-free number at 1-877-293-5740 to speak with a supervisor, verify the interviewer, and/or complete the interview over the phone. 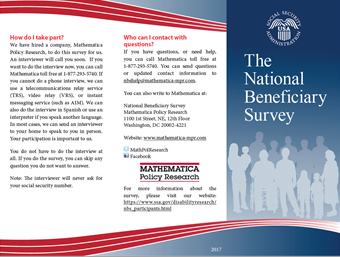 We require all in-person interviewers to show a Mathematica Policy Research badge that displays a color photograph of the interviewer, the name of the survey, and the toll-free National Beneficiary Survey help desk number 1-877-293-5740. We combine your answers with those of other survey participants to produce important statistical information about our Supplemental Security Income (SSI) recipients and Social Security Disability Insurance (SSDI) beneficiaries. Government policymakers, legislators, administrators, and researchers use the data from the National Beneficiary Survey to provide a portrait of who receives disability benefits and for planning and evaluating Social Security policy and programs. The National Beneficiary Survey (NBS) results provide estimates for the nation as a whole to obtain accurate information about individuals who receive Social Security Disability Insurance (SSDI) and Supplemental Security Income (SSI) disability benefits. Government policymakers, legislators, administrators, and researchers use the data from the NBS for policy and research purposes. Answers to the survey questions will help us learn how well our programs meet your needs and the needs of people like you. The information you provide will give us a better understanding of the characteristics of SSDI beneficiaries and SSI recipients. We use the information to assess how well our programs work and to respond to questions from Congress and the Office of Management and Budget (OMB). We release the answers to the questions in the NBS survey in research reports and summaries for Congress and the general public. Please visit our NBS page for more information, documentation, and reports. We will not use your information to make decisions about your disability benefits. Will the $30 gift card Thank You affect my benefits? We consider the $30 gift card unearned income because it is only received once and it is under the $60 threshold used to calculate the benefits of Supplemental Security Income (SSI) recipients. The $30 incentive payment is unearned income that falls under the “Infrequent or Irregular Income Exclusion” (POMS: SI 00810.410). This exclusion applies to income that you receive infrequently or irregularly and is less than the first $30 per month for earned income and/or the first $60 per calendar quarter for unearned income. Since these payments are unearned income under the $60 threshold and received once, they are wholly excluded in calculating the benefits of SSI recipients. When will I receive my $30 gift card? You will receive the gift card within 2 weeks of completing your interview. If you do not receive your gift card on time, please call Mathematica Policy Research at 1-877-293-5740. Does everyone receive a $30 gift card? Everyone who completes a survey will receive a $30 gift card. An independent research company, Mathematica Policy Research, helps us with this study. You may have received letters, postcards, or brochures from the Social Security Administration or Mathematica may have attempted to call you or visit your home. Please see some samples of these materials. Please note that some text may be different from the actual mailings. Mathematica Policy Research, an independent research firm, helps us with this study. You may have received letters, postcards, or brochures , from the Social Security Administration or Mathematica may have called you or visited your home. Do you have questions about the study? Do you want to confirm that the materials you received in the mail or the person who visited your home is legitimate? Please call Mathematica toll-free at 1-877-293-5740 or send an email to nbshelp@mathematica-mpr.com. 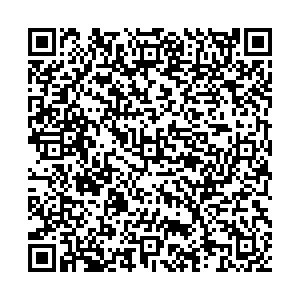 You can also add Mathematica Policy Research as a contact to your phone by scanning this QR code: Do you have questions or need assistance regarding your Social Security Administration benefits? Or other general Social Security questions? Please contact the Social Security Administration.